Get your hands on some precious prizes in Crown Jewels, a five-reel slot from Barcrest featuring cascading reels. 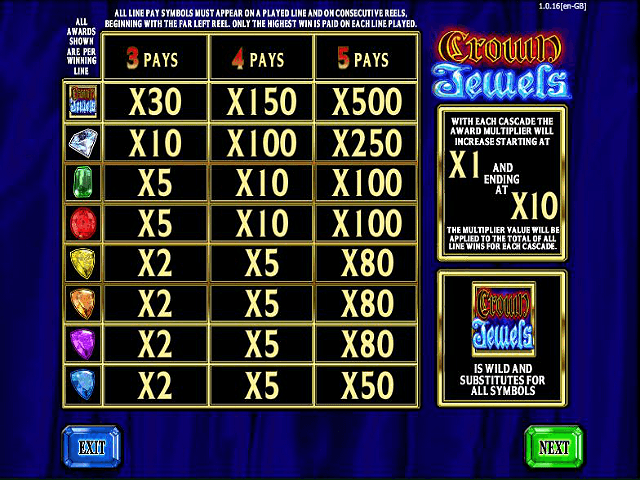 Along with Crown Gems and Jewel in the Crown, this is another regal-themed online slot machine from the British software provider. 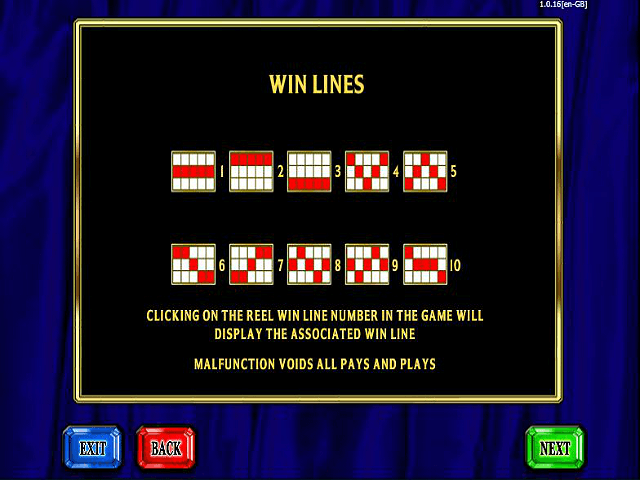 The cascading reels feature means there are some big multipliers on offer in this game. Read our review as we guide you through how to play Crown Jewels. 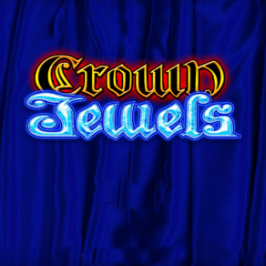 Play Crown Jewels for Real Money! Grosvenor Casinos can be found throughout the United Kingdom, and have become known for supplying stellar casino gaming. In recent years the company has expanded into the online casino market, and the results more than live up to their physical counterparts! Following a recent full-site revamp, Casino Room is poised to skyrocket to the top of the online casino industry in the UK. Thanks to some stellar slot provider partnerships and almost 300 titles on offer, Casino Room has all the tools to ultimately be the best online casino UK players can enjoy! 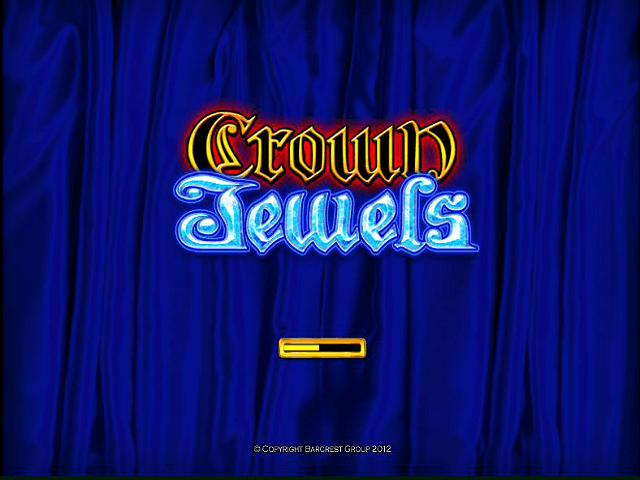 Crown Jewels features a conventional layout of five reels and three rows set against the background of a blue silk cloth. The graphics are fairly plain and basic and the buttons are laid out like traditional physical slot machines although there is a sort of futuristic, synthesised jingle that accompanies every spin. The number of paylines is fixed at ten with a minimum stake per line of 1p and a maximum of £25. In other words, your total stake can vary from 10p to £250. There is also an auto play option which can set up to 25 spins to run automatically, which is quite handy for this game given the number of lines is already set. As you would expect, most of the symbols are made up of precious stones: diamonds and gems of various colours. The highest-paying of these is, of course, the diamond, which pays out 250 coins times your multiplier if you land five of them or 100 coins if you get four. However the most lucrative symbol in the game is the game logo itself. Landing five of these in a payline will award you with 500 coins times any multiplier you have, while four of them are worth 150 coins times multiplier. The logo also substitutes for other symbols, which means you’ll often get wins across more than one line. 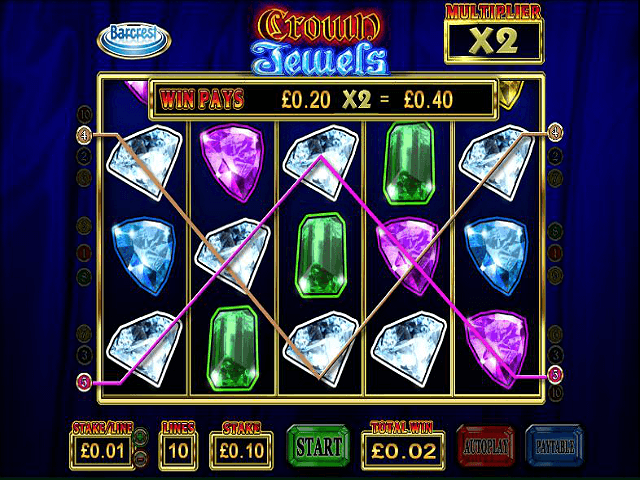 As mentioned, cascading reels is the main attraction of Crown Jewels. This means that when you land on a winning combination, the symbols in that payline disappear and are replaced by new symbols from above, allowing further wins to be generated from just one spin. There’s an added twist to the feature in this game because for every win created by a cascade, the multiplier goes up by one, starting at 1x and rising to a maximum of 10x, so there are some massive potential prizes up for grabs in Crown Jewels. The cascading reels stop when you stop winning or when you reach the maximum multiplier of 10x. Unusually you can see the bottoms of the symbols on the next row up in this game, so if you know your pay lines, you can get an idea of your winning possibilities when the cascade starts. These cascading reels are a popular feature in online slots, with the ability to substantially boost your winnings. It’s well worth having a spin on Crown Jewels and seeing if you can uncover some gems. Share this Crown Jewels Review today! If you like Crown Jewels, you'll love these slot titles too!